I’ve heard from some (NOT all) Boomers that my generation needs to pull themselves up by their bootstraps and face financial responsibility. The weird thing is that many people my age are really desperate for a chance to do so. The world Millennials are facing now, is not the same world Boomers faced at our age. We are a “stuck” generation largely because of inherited circumstances, not because of our own irresponsible choices. We are loaded with student loans, largely unemployed or underemployed, and there is no light at the end of the tunnel. (Some) Boomers bemoan the Millennial mindset as wanting to “have it all” without paying their dues. We (supposedly) expect that new car, a bigger house, and promotion right away. The thing is– NONE of those things are part of the Millennial ‘American Dream’. Our wildest dreams include finding employment, and moving out of their parents houses. We don’t have ambitions to even buy new cars (hence the clever car commercials targeting Boomers). Even with the buyers market as ripe as the the 1950s many Millennials still aren’t buying new houses. Unlike our Boomer predecessors, this isn’t a generation trying to attain, but just trying to get out of a hole. And we haven’t even hit 30 yet. 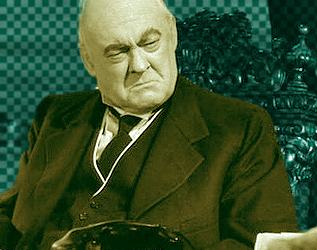 Some of the heavy-handed preaching of financial obligation conjures up images of the infamous Mr. Potter from It’s a Wonderful Life. A banker who cares little for the hard times that have hit the lives of his clients, and holds them to their ‘moral obligation’ to his bank. The Millennials have been labeled as a Civic generation. The last Civic generation was the GI Generation which included people like Jimmy Stewart who plays George Bailey in It’s a Wonderful Life. I won’t get into the comparisons between the two generations in this post, so in short– it’s not surprising that the Millennials, a generation of George Baileys, know a Mr. Potter when they see him. Here is a movie quote from George Bailey to Mr. Potter. They had to wait and save their money before they even ought to think of a decent home. Wait? Wait for what? Until their children grow up and leave them? Until they’re so old and broken down that they… Do you know how long it takes a working man to save $5,000? Just remember this, Mr. Potter, that this rabble you’re talking about… they do most of the working and paying and living and dying in this community. Well, is it too much to have them work and pay and live and die in a couple of decent rooms and a bath? Anyway, my father didn’t think so. People were human beings to him. But to you, a warped, frustrated old man, they’re cattle. Well in my book, my father died a much richer man than you’ll ever be! The financial strains in our country are very real for people of all generations. Our current situation is complicated. But– here is what I think about the issues of responsibility: Assuming a lack of responsibility on the part of individuals without taking into account the irresponsibility of an institution (or previous generations) is wrong. As a parent of millenials, I am totally sympathetic to their situation. Great insight. Thanks for feedback. I think a lot of Boomers are sympathetic to the situation 20somethings are in right now. The article I mentioned, “OWS: Why Boomers Don’t Understand the Protests” is written by a sympathetic Boomer. Boomers forget that they didn’t do a damn thing in the 60s (and 70s) and skirted fighting in Vietnam. It’s ironic that we’re labeled entitled for wanting such lavish things like jobs that pay enough to cover rent and food with some left over to save. The Boomers are the ones lived off the prosperity that the Greatest Generation allowed this country to have. The Greatest Generation lived through the depression and WW2 and when the war ended the got to rebuilding this country and then had kids, the Boomers. Boomers benefited from a more peaceful world, the interstate system, and racial desegregation. I’d hardly say that they are entitled to call Millennials entitled for wanting nothing more than the opportunity to prove themselves.